August 9: If it’s going to be hot, there are two good options: go to the beach, or head for the mountains. Today I opted for the latter, following a route recommended by Nick and his friends. I drove a little ways north of Sparta, just a bit further than Sellasia, and headed east into the region of Mount Parnasos. Immediately after I turned, I saw an official highway sign that said, “Hellenic Fortress.” This was not part of my suggested tour, but I figured that any good adventure deserves a little exploration. So I headed up a dirt road that soon became an interesting challenge – to call it a “road” at that point would be generous. But I figured I was already partway there, so I braved the rocks and the ruts and went up, up, up. When I arrived at the top, there was no fortress to be seen (there was another sign that proclaimed “Hellenic Fortress,” but no fortress anywhere at all – not even evident remains of one. But there were two other structures: a small church and a fire tower. 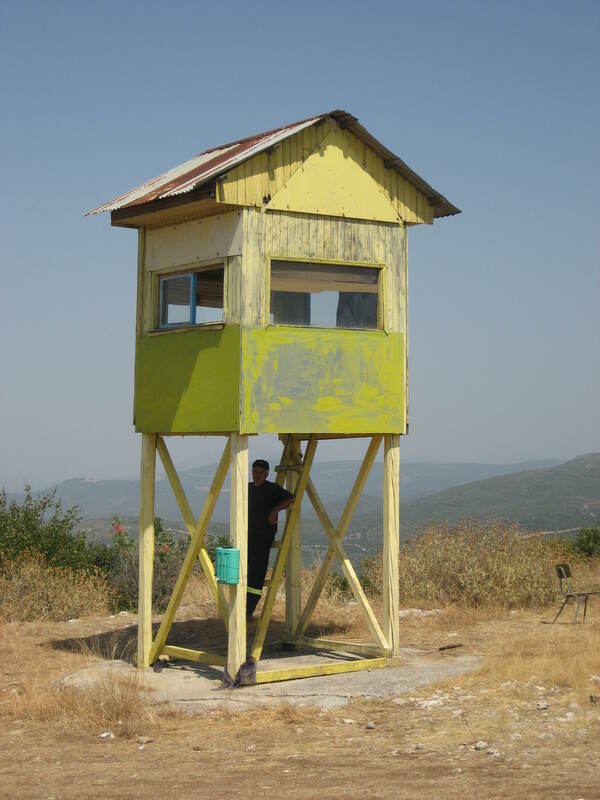 I thought the fire tower was unoccupied, since mine was the only car in sight, but then a fireman climbed down and said hello and a number of other things in Greek. He invited me up to see the view from the fire tower, which was pretty spectacular. He then proceeded to try to communicate with me for quite a while, but this wasn’t an especially successful endeavor. I think I understood about ten words total that he said. So, after shaking my head and apologizing a lot, I got back on the road. 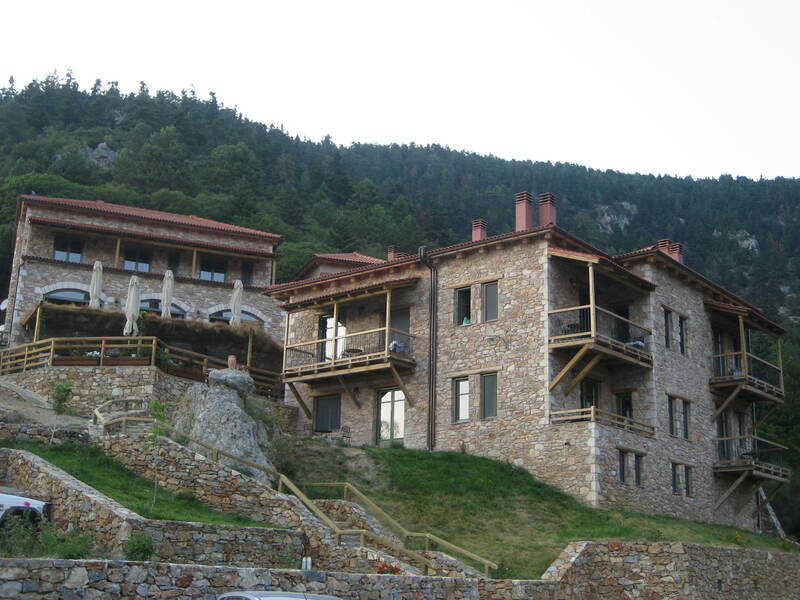 My next stop was the Monastery of the Ayioi Anargyroi. The monastery is located deep in the mountain forest, a really beautiful location which, like many of the places I’m going today, make you ask, “how did anyone get here in the first place?” Unfortunately, the monastery was closed when I arrived (I didn’t know monasteries could close, but I guess the monks do need some private time). So I climbed up a small hill to peer over the monastery wall (the wall was effective at keeping me out, but it wouldn’t have stopped the Ottomans) and took a little peek at the grounds. Now I’m having lunch at a hillside restaurant that overlooks the beautiful village of Polidroso (the locals call it Tsintzina, which made me think I was happily lost for most of the afternoon). It’s the first meal I’ve had that doesn’t involve tomatoes in some form – in fact, if it weren’t for the sausage (sorry, vegetarianism, but I had to try the local meat), I would think I was at a French restaurant. My main course was a salad of lettuce, oranges, some kind of strong local cheese with a blue-ish flavor, and raisins and figs steeped in red wine. It’s all very elegant, and the view is superb. I lingered at the restaurant for a while, first over vanilla ice cream with bergamot (not a good choice, but I couldn’t resist trying bergamot fruit for the first time), and then over complimentary watermelon and honeydew. I started chatting with the waiter, who spoke better-than-passable English, and then another gentleman stopped to chat with me. 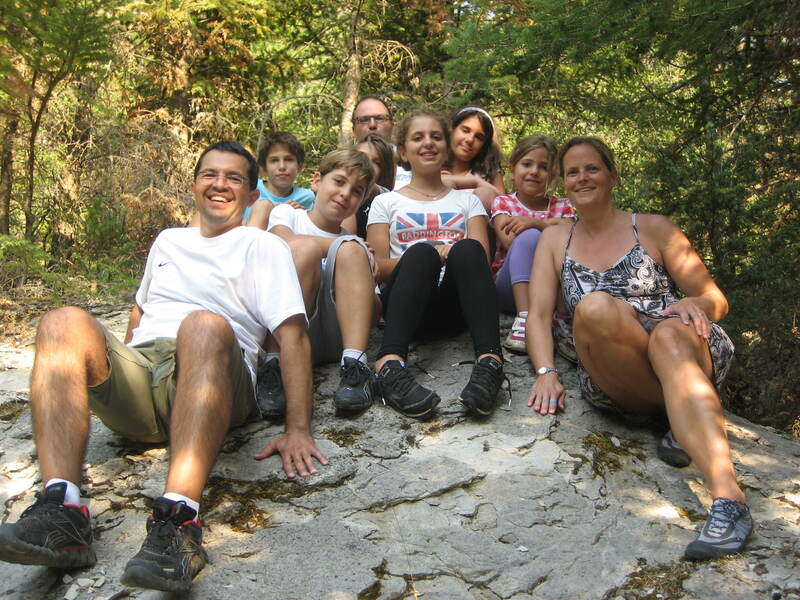 The long and the short of this is that I ended up with an invitation to join two Greek families (one of which had lived in Canada; the other of which has a mom who’s an English teacher) on a hike. This was a great excursion, up through fir and pine forest to see two tiny churches (Greece is filled with these, all over the place). 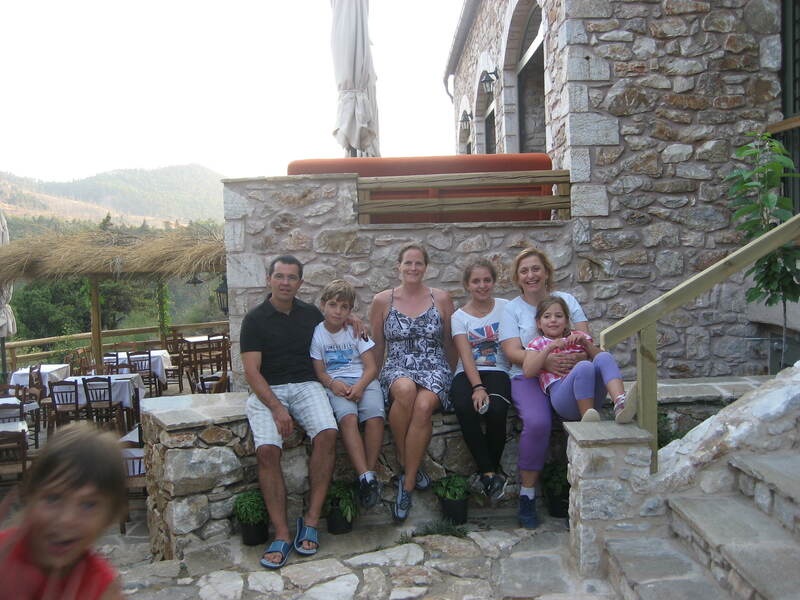 The families (mom Elsa; dads Yiannis and Panos; kids Sophie, Ellie, Marianna, Georgos, Aris, Yiannis) were so friendly. Sophie is thirteen and pretty much fluent in English (and I think she will soon be my friend on Facebook). We had a really good time together. 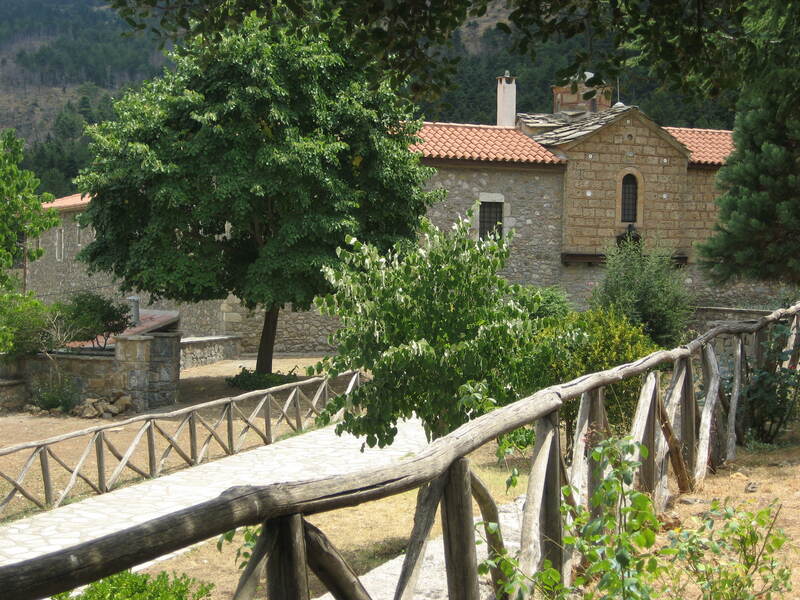 We ended the hike at Panos’ family home in the village with a quick glass of water. Then I took myself for a walk through the village, which was as dear and village-y as they come. It was so nice to walk by a spring-fed stream – everything is so dry here that the sound of running water is a real relief! 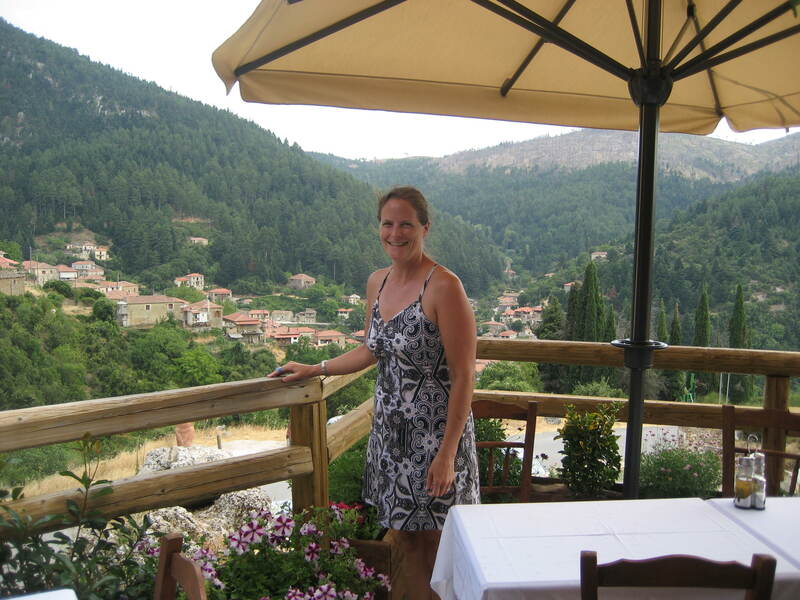 I was reluctant to leave – I could happily have spent more time with everyone in this beautiful forest village. My drive home took me through a bit more pine forest to the other side of the mountain, which had a few beautiful chestnut groves. The landscape for much of the rest of the drive was pretty barren – a rocky area with scrub, and a large section that had clearly been burned in the 2007 fires. 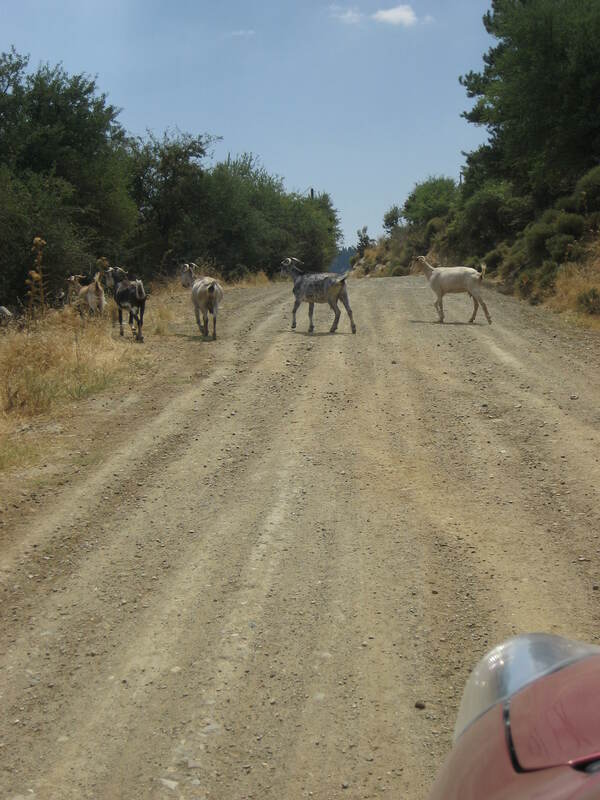 And beware of goats in the road (at any point, really)! I was pretty proud of myself for finding a back way around Sparta, though as I drove on the entirely unmarked dirt roads I thought, “no one in my family would think this is a very good idea.” But it worked. I’d planned on heading to the “other tavern” (the one I haven’t been to yet) for dinner, but I was kidnapped by Nick and Georgia again. 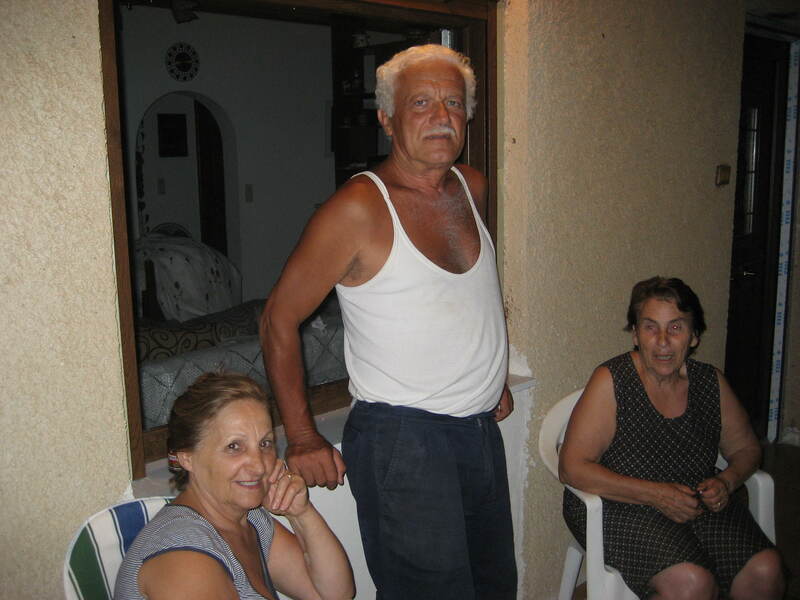 They had Nikos and Nicoletta over on their porch, and we all hung out for a while. I guess they’d already had dinner, but Georgia plied me with a variety of fruity things: a quince “sweet spoon;” fresh plums and tiny pears; and homemade plum marmalade on rusks. Not really the dinner I’d had planned, but it’ll do. They’re so friendly that I was happy to stay.